According to a study recently published in the Journal of Neuroimmune Pharmacology, researchers at Chicago’s Rush University Medical Center found that ground cinnamon eaten by mice with Parkinson’s improved their motor functions, stopped the loss of Parkin and DJ-1 and normalized neurotransmitter levels. 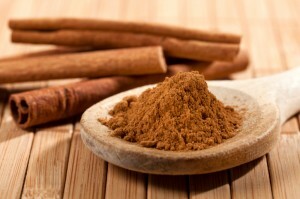 When eaten, the liver converts cinnamon into the chemical sodium benzoate, an FDA-approved drug for neural disorders. “This could potentially be one of the safest approaches to halt disease progression in Parkinson’s patients,” said Kalipada Pahan, Ph.D., study lead researcher and the Floyd A. Davis professor of neurology at Rush. The two most common types of cinnamon sold in the U.S. are Chinese cinnamon (Cinnamon cassia) and Ceylon cinnamon (Cinnamonum verum). Both types convert to sodium benzoate, but according to Dr. Pahan, Ceylon is better because it is more pure. Parkinson’s disease is a degenerative disease with no known cause. In the United States, 50,000 to 60,000 new cases of PD are diagnosed each year. The Centers for Disease Control ranks Parkinson’s-related complications as the 14th leading cause of death in the U.S. Symptoms include resting tremor on one side of the body, overall slowness of movement, stiff limbs and balance problems. “Understanding how the disease works is important to developing effective drugs that protect the brain and stop the progression of PD,” said Pahan. The next step, of course, is to test the effects of ground cinnamon on humans with PD.